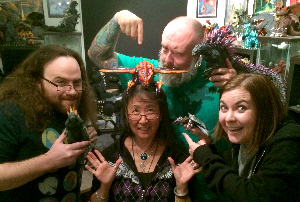 Bryan, Cindy & Rachel join Kyle to chat about Godzilla X Megaguirus (2000). Hey, we still have a few minutes or so left in September; I can do this before October hits (…in Hawaii)! This month, we dive into the second movie of Toho’s “Millennium” series, Godzilla X Megaguirus (2000). As I mention in the discussion, this is the directorial debut of Masaaki Tezuka – a director who I think was honing his craft and improving his filmmaking throughout this series. That being said, the film is not without its flaws – which are sometimes as obvious as visible wires (cue the facepalm). Congratulations to Keith Foster for successfully funding his kickstarter campaign! Please go support Kaiju Gaiden – a new independent documentary about independent kaiju films! It’s time for the Kaijucast to cover Dogora (1964)! We’ll be watching the Media Blasters DVD of this and apparently, it’s just not available anymore… certainly not legitimately*. So if you are fortunate enough to own this DVD or another version, you’ll need to get your homework turned in before October 22nd to be included in the next discussion episode. Please use the handy contact form to submit your thoughts, questions and reviews – thanks!